A fluorometric method was developed for the determination of the insecticide cartap. 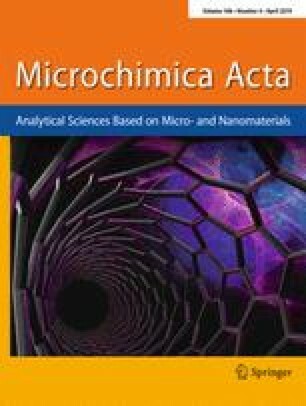 It is based on the use of green emitting carbon dots (CDs) and gold nanoparticles (Au NPs). The CDs were prepared from phenol and ethylene diamine by a hydrothermal route. They have excitation/emission maxima at 410/513 nm) and a fluorescence quantum yield of 29%. They were characterized by TEM, Raman, XRD, XPS, FT-IR, UV and fluorescence spectroscopies. The green fluorescence of the CDs is strongly reduced by the red-colored Au NPs because of an inner filter effect. Upon addition of cartap, it will cause the aggregation of the Au NPs owing to Au-N interaction between Au NPs and cartap to form purple colored aggregates with spectra that do not overlap the green emission of the CDs. Hence, their fluorescence is restored. Under optimum conditions, the method allows for the quantitation of cartap in the 5–300 nM concentration range, and the detection limit is 3.8 nM. The method was successfully applied to the determination of cartap in spiked real samples and gave satisfactory results. 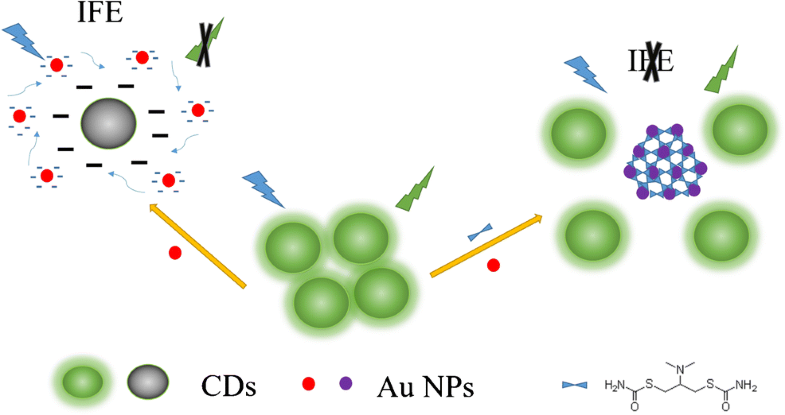 Schematic presentation of green emitting carbon dots for sensitive fluorometric determination of cartap based on its aggregation effect on gold nanoparticles. The online version of this article ( https://doi.org/10.1007/s00604-019-3361-5) contains supplementary material, which is available to authorized users. This work was supported by the Fundamental Research Funds for the Central University (2018CDYJSY0055), Chongqing science and technology commission (CSTC2015 shmszxl20097), the National Natural Science Foundation of China (31171684), the workstation in Sichuan Province(GY2015-01) and sharing fund of Chongqing University’s large equipment.